PhD student Paolo Fraccaro receives his BCS award from HeRC's Dr Ben Brown. 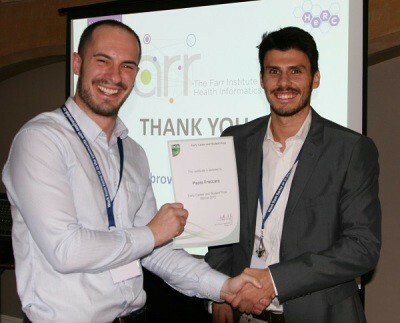 HeRC PhD student Paolo Fraccaro had cause to celebrate recently when he was awarded a prestigious Early Career Award by The Chartered Institute for IT’s, Primary Health Care Specialist Group. The Award, which recognises innovation and excellence in Primary Care Computing, was awarded to Paolo, a third year PhD student, for his work in helping to create a cultural shift in the way primary care computer systems are used by both health practitioners and patients. With existing platforms geared-up to treat the ‘average’ or standard patient, Paolo’s research is redressing the balance towards a more bespoke and personalised method of efficient healthcare delivery; through the application of advanced statistical methods to existing information practices. The award ceremony, which took place at Stratford-upon-Avon’s Ettington Park Hotel on the 9th October, was part of the British Computer Society’s annual conference and included a distinguished audience of researchers and clinicians. Paolo was presented with his award and £250 prize money by last year’s winner and fellow HeRC researcher Dr Ben Brown. In the face of some tough competition it was the breadth and scope of Paolo’s work that gave him the edge over his fellow award nominees. With patient-safety at the heart of his work, Paolo has been investigating – amongst other things – how the results of a patients laboratory tests can be more-meaningfully fedback to GP’s so that they might better understand where the most urgent health needs are occurring. Related to this, Paolo has also been looking at how best to present the results of lab test to the patients themselves when accessing data online. Through better data visualisation techniques it is hoped that patients will be able to make better sense of their test results and understand more about their health conditions. Funded through the NIHR Greater Manchester Primary Care Patient Safety Translational Research Centre, Paolo’s work sits within HeRC’s Actionable Healthcare Analytics theme. He said: “It is a great honour to receive this award and I would like to thank The Chartered Institute for IT for acknowledging my research. Led by The University of Manchester and bringing together research excellence across the North of England (in partnership with the universities of Lancaster, Liverpool and York) the Health eResearch Centre is increasing the pace of progress in the UK’s health sector by turning under-used health information into new knowledge. The NIHR Greater Manchester Primary Care Patient Safety Translational Research Centre is funded by the National Institute for Health Research (NIHR) for five years (£6,291,208 from August 2012) and works on behalf of Salford Royal NHS Foundation Trust, in partnership with The University of Manchester. It is a unique and groundbreaking Centre, with a strong patient and public involvement and engagement agenda.